Labyrinthian is a sprawling Nordic ruin in Hjaalmarch, containing the entrances to several indoor dungeon areas. It is southeast of Morthal and north of Hamvir's Rest. The easiest way to get to the ruin is across the wilderness from Morthal, though it is possible to reach it from the south. Coming from the south you must travel north between Hamvir's Rest and Silent Moons Camp into a valley which ends at the ruin. 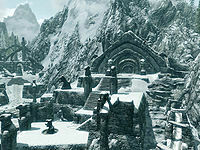 Situated in a mountain pass between Hjaalmarch and Whiterun Hold, Labyrinthian is the ruins of an ancient Nord city. The outdoor ruins contain the entrance to the Labyrinthian ruins as well as two other indoor zones: Shalidor's Maze and Lost Valkygg. The exterior is patrolled by up to four frost trolls. Approaching from Whiterun Hold, the pass is to the northeast of Dustman's Cairn, northwest of Silent Moons Camp. The approach is made under two huge arches before coming to the first wall with a smaller arch through it. This is where the first Frost Troll roams. From the top of the first flight of stairs you will see various levels around the ruins with stairs up and down. From the bottom of the first flight of stairs you can either climb stairs on the left to a raised area with three burial urns on, or continue along the main path. In front of you is a circular building, the entrance to which is on the northwestern side of the building. In the center there is a skeleton of a Breton, beside them is a note that explains what happened to him and the Wooden Mask that gives access to Bromjunaar Sanctuary. There is an Orcish dagger stuck in the ribs of the Breton. To the east of the circular building is the entrance to Shalidor's Maze, with an urn and novice-locked chest by the entrance. To the left of the entrance to Shalidor's Maze is the exit for Lost Valkygg. Entering this door will only give access to the final room. To the west of the circular building are two stone huts that are empty, with a flight of stairs up to an empty raised area. Beyond this to the northwest is a ruined tower with another frost troll inside. There are two large urns and a damaged flight of wooden stairs that lead nowhere in the tower. From outside the tower, to the northwest is an arch through the northern outer wall. To the left are wide stairs that lead up to the first of several terraces that ultimately lead to the main entrance to Labyrinthian. The first terrace is devoid of anything of interest. Continuing up the next flight there is a large urn beside the stairs. The third terrace leads around to the right to a lookout point and a burial urn. The main flight of stairs lead up to the "Ceremonial Door", which is the main entrance to the interior of Labyrinthian. It requires you to have the Torc of Labyrinthian. Therefore, the interior of this dungeon is inaccessible until the relevant quest has been started. Labyrinthian has a second exit named Labyrinthian, Tribune located to the southeast, but a bolted door early on prevents using this as another entrance. At the bottom of the stairs up to Labyrinthian is an empty cart, with a path between two flights of stairs that lead to nothing of interest to the east of this. Along the path is the third of the frost trolls beside a building that contains an urn. At the end of the path there is an area to the left of the wide stairs, if you walk to back, underneath a bridge joining the outer wall to a raised section above you there is an unlocked chest. The wide stairs lead up to the raised platform, with a bridge linking it to the outer wall and to a second flight of stairs that leads to the entrance to Lost Valkygg. North of the empty cart are stairs down to a lower area. West of the lower area has several empty stone huts with different levels of snow drifts in them. To the east are stairs up to a level with the last of the frost trolls. At the top of the stairs there is an arch with an unlocked chest underneath, next to a cave-in. Crossing the bridge to the outer wall and following it west, the second of the lookout points has a random bow laying on it. A short way further along there are stairs leading back down to the lower area with the stone huts. At the far western end is a burial urn. The approach from Hjaalmarch is found by traveling from Morthal towards Stonehills mine, as you travel, shortly before reaching some rubble on the left-hand side of the road there is a turn off to the right (south). Follow this to the bottom of stairs and a path leading up with several switchback turns until you reach the entrance through the outer wall. There are several cages by and hanging from the arch you pass under. Upon activating the ceremonial door, the Torc of Labyrinthian is removed from your inventory and becomes a knocker on the door. You then appear inside the ruin in a large room with several dead skeletons laying about the room all facing towards the exit, they can be looted for bone meal or a few coins each. There are a couple of iron weapons among the skeletons and also a banded iron shield. Around the room are three large urns and near the east wall is a stone table with stone benches surrounding it. On the table is a random resist cold potion and a random spell tome of Detect Life, Ironflesh, Waterbreathing or Telekinesis. To the north there are a few steps down to an unlocked iron door that leads further into the ruin. Beyond the door is a corridor with a flight of stairs on your left up to an urn and a blisterwort fungus. Further along there is a burial urn on the left and two more blisterwort fungi one on each side of the path. At the bottom there is a closed gate with a lever to the left as well as three white cap fungi, two urns and a burial urn. Beyond the gate you can see several skeletons, some of which are magic users standing around a huge room. The corresponding lever only raises the gate for a few seconds, however there is another lever on the other side to allow you to pass back this way. As soon as you enter and engage the skeletons, a skeletal dragon will rise from a mound in the middle of the room and join the fight. It breathes frost, so be prepared. Arrows cannot be shot through the closed gate, but some spells and shouts can. It is also possible to raise the gate and shoot through the open entrance without entering. You can thus eliminate the skeletons and even the dragon before going into the room. In addition, the dragon doesn't fit through the gate, so if you have entered, you can retreat back through it to take cover. There are four large urns and four burial urns around the room. To the east is an exit from the room, down a flight of stairs. At the bottom of the stairs is a plinth with an etched tablet on top, from here stairs descend to the south to a pair of doors that open into Labyrinthian Chasm. There is an urn buried in the rubble in an alcove just to the north of the plinth. This starts with another room with twin stairways proceeding down, however the left-hand stairway has suffered a cave-in. Among the rubble is an urn and two burial urns. Against the west wall is a set of shelves which holds nothing but clutter and hiding behind a pillar an unlocked chest. As you descend the right-hand stairway you will hear the voice of Morokei, which will drain your magicka every time you hear him, and a frost spirit will spawn from a door with frost and ice around it. On your immediate right, standing in an alcove, is a slumbering draugr. At the rear of the room is an alcove with a plinth holding a spell tome: Flames. The only other items in this room are a couple of White Cap mushrooms. When you cast Flames at the icy door it will open, revealing the path forward. As you pass through the door, you will hear Morokei's voice again and see a large chasm with a walkway passing across it below you and a draugr standing on it. Be careful as there are several draugr in this area and any fighting can alert several to converge on you. A lot of them are leveled and can be deathlord who can knock you off the walkway using shouts and it is a long drop that could potentially kill you. As you descend the first walkway there is a second draugr at the end of the walkway standing by a doorway leading to the south. The walkway also continues down from here. Through the doorway you will find stairs going down with another leveled draugr roaming at the bottom next to a lit brazier. The path enters a corridor, at the corner is a damaged sarcophagus with an ancient Nord helmet and sword laying inside. The corridor leads to an unlocked iron door that has a lightning rune on it. 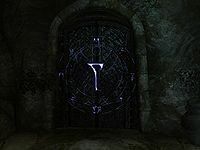 Behind the door is a room containing a draugr who will normally hear you destroying the rune and come to investigate. The room contains a table with an arcane enchanter built into it with a chair drawn up in front with the skeleton of a novice conjurer that was obviously killed where he sat in the chair. There is blood over the enchanter and floor. On the table is a random filled soul gem, a copy of Immortal Blood, a copy of the spell tome Equilibrium and two bowls of bone meal. In an alcove to the right of the table is an alchemy lab with two bowls fire salts, a bowl of ectoplasm, a bowl of bone meal, a deathbell and a giant lichen sample in boxes on the floor either side of it. You will need to backtrack to the chasm to continue onward. Following the path down the next walkway, as you approach the walkway with the arch over it, you hear Morokei's voice again. At this point, you alert another leveled draugr to your presence, even when sneaking. Be very careful as you can get blown off the walkway to drop to the bottom if they use a dragon shout. There are quite a few nightshade plants along these walkways. Ahead is a well lit doorway, so follow the path up and around the corner. Ahead there is an urn along with two fly amanita mushrooms. The path turns again and enters a room patrolled by another leveled draugr. On the far side of the bridge, on the left, is a stone bowl containing a deer hide and a piece of gold ore. On the left by the bridge is a leveled potion of enhanced stamina and a leveled potion of the berserker. Just out of sight is a second draugr which is standing in an alcove with a table holding a burial urn and gold sapphire ring. At the end of the room is another cave-in, with a partially buried burial urn among the rubble. There are stairs leading down, running back towards the bridge you crossed. At the bottom is another brightly lit area with an open door to the northeast and three sets of shelves and an urn along the back wall. One of the shelves has been knocked over and contains nothing of interest. The other two contain a salt pile, a sample of scaly pholiota fungus, two deathbell flowers, a bowl of bone meal and a filled random soul gem. Through the door, you enter a cave-like area with a path leading down to a stream flowing north to south, and to the right there is a ledge leading up to a dead Argonian with an ancient Nord greatsword sticking out of them, an unlocked chest and small coin purse beside them. Take the path down to the stream. To the north you see an iron door at the end. To the south you see stairs leading up, take this route to check out the bottom of the chasm you've been descending steadily. There is a nirnroot and a couple of hanging mosses on your right. At the end, opposite the stairs, is a ramp leading back up to where you previously descended. Heading north along the stream, again you will head Morokei's voice part way along the stream. At the end the iron door leads to Labyrinthian Thoroughfare. Upon entering you are still following the stream, after a short distance there is a closed gate ahead. Passing through this you can hear a skeleton ahead around the corner. There is also a draugr that you will have to fight along with the skeleton. There is a path in the northwest corner and a novice-locked gate in the southwest. Through this on your right is a stone bowl containing a second piece of gold ore. The path heads down stream to bars blocking the way. On your right is a path that leads to two unlocked chests and two burials urns. Again there is a path on your right, following this it ends at a broken walkway with a path below you on the right and a doorway below you ahead. Taking the path in the northwest corner leads to a skeleton magic user. There are two Namira's rot mushroom and a burial in the corner with the path continuing to the north. Immediately on your right, behind some vegetation in shallow water are a total of four pieces of malachite ore. You may need to push them up out of the water in order to pick them up. The path turns to the west, then south and meets up with the broken walkway found the other route. The only way onward is through the doorway to the west. You can hear a troll nearby. The doorway leads into a room with scattered bones and three barred windows on your right. You are at the top of a couple of flights of stairs. From the top of the stairs looking south, you see a chest in an alcove. Behind the stairs is a skeleton that can be looted, in front of the unlocked chest seen from above. In the western corner of the room is a bleeding crown mushroom. There are a couple more skeletons to be looted in the room. Looking through the windows you will see a large cavern with walls blocking part of it off with bars blocking an arch through and a walkway with several skeleton roaming. To the east is a large urn and also a corridor with a troll stood at the start of it. The path heads north and after a couple of turns enters the huge cavern seen through the windows. You are at the top of a flight of stairs leading down to a walkway over the cavern floor. Looking from the top step, down to the west you will see two skeletons stood guard and two gold ore veins on the ground. From the bottom of the first flight of stairs you can see two more skeletons stood on top of the wall with the barred arch. Following the path across the bridge leads to an area with a rock pillar in the middle, behind this is a troll and to the right of the troll is a tunnel heading west. You enter another cave with another troll, that has quite a bit of vegetation, blood and bones around it. Once defeated there are three blisterwort fungi and four nightshade plants in this cave along with an urn, a burial urn and an unlocked chest at the back. Return to the main chamber and descend to the floor, as you approach the barred arch you will hear Morokei's voice yet again. Don't forget to mine the ore veins (see bugs). The lever to open the bars blocking access past the arch is to the right of the arch. As you pass under the arch, on your right is a large urn and burial urn with a second burial urn near a flag and lit brazier. In front of you are two large sculptures blocking your view of the rest of the cavern. You will need to move around these to the left. Behind these is a graveyard with three wisps patrolling it. Instead turn around and head up some stairs that lead to the top of the wall, you will find an unlocked chest with a highly leveled magicka poison next to it. Passing through the graveyard ignoring the wisps to the western corner, you will find stairs up to a raised section across the rear of the cavern. This is where you will face a wispmother. Defeat her and the wisps become glow cores, don't forget to collect them. There are a row of coffins on shelves along the back, some of which may contain a few septims or bone meal. On the left of the coffins there is an unlocked chest. The path crosses a wooden bridge to the east, which has a hanging moss growing from it, towards a door with flames covering it. This reacts similar to the frost door found earlier, producing a fire Spirit and hearing Morokei's voice. There are two scrolls of Ice Spike and a spell tome of Frostbite to the left of the door. Through the door is a corridor that end in a cave-in, with two burial urns among the rubble. Before this there is a path to the north that passes through a close gate into a room with the start of a spiral staircase leading down, however it is blocked after a couple of feet with a White Cap fungus and nothing else. There is also a tunnel heading east with a skeleton stood guard part way along it. Using a ranged weapon to deal with the skeleton will alert a spectral warhound and spectral draugr wight. There are a couple of White Cap fungi along this tunnel. As you approach the end you will hear Morokei's voice yet again. At the end is a trapdoor with water cascading down into it from above. Looking down you can see more spectral enemies below. There is a tunnel to the southeast that turns and continues down, before opening into a wider corridor. There are three blisterwort fungi and three nightshade plants growing along it. At the bottom of the stairs there is a doorway that leads into a room. As you approach a sarcophagus will burst revealing a leveled spectral draugr on the left. You emerge on a raised area with wooden stairs down to the lower part of the room. There is a spectral draugr and skeleton stood guard at the bottom, they will definitely be alerted while fighting the first draugr. On the raised section opposite where you entered is a set of shelves containing a gold ingot and random empty soul gem; behind the shelves, on a platform you can jump to, are two burial urns and two pieces of gold ore. On the lower level are three nightshade plants and one blisterwort fungus. To the west is a closed wooden door. Through the door is a corridor that leads to below the trapdoor you previously passed, there are two leveled spectral draugr here and possibly a dead troll. There are a couple of urns and burial urns around the room and against the eastern wall is a set of shelves holding another burial urn. In the northwestern corner is a doorway into a corridor that has a bleeding crown mushroom growing in a stone bowl to the south and an iron door to the north. This door leads to Labyrinthian Tribune. Upon entering you are in a badly damaged catacomb area, with quite a lot of vegetation including a couple of blisterwort mushrooms around. As you descend you will pass a couple of dead draugr that can be looted. At the bottom at the start of a corridor is a leveled spectral draugr, there is also another leveled draugr and a spectral warhound around the corner out of sight. Once they are all dealt with continue down. At the bottom there is a plinth with a copy of the spell tome Steadfast Ward, with an unlocked chest and a couple of barrels beside it. There is an open door to the west that leads down a flight of stairs and into another room. Take care here as this room has a total of five spellcaster traps. The first is on your right as you enter, three more are at the far end of the room. The middle one fires firebolts, while the other two fire flames. The final one is on the left near the start of the room. The first and second fire frostbite. There is also a frost rune part way along the room. On your left as you enter the room there is an unlit brazier that contains a bottle of alto wine and a basket that contains two iron ingots, a random potion of resist magic, a random potion of lasting potency and a random potion of extra magicka. Through the doorway at the end where the three spellcaster traps are, it appears to be a typical tower with stairs up on the left leading to another door that with a ramp up to a high level. Through the door you can see another leveled draugr. Fighting this one will alert another that is on the ramp and possibly one that is in the room above. Once dealt with climb the ramp harvesting hanging mosses on the way. There is a nightshade plant at the top of the ramp. The room above contains a leveled draugr unless you've already dealt with it. There is an urn and several barrels in this room, some of them contain ingredients. There is a flight of wooden stairs leading up again with an unlocked chest and burial urn underneath. Climbing the wooden stairs to the top level you find an unlocked chest and a stone bowl that contains a piece of malachite ore. Return to the bottom of the wooden ramp and follow the earthen ramp down to a flooded section. Under the water you will find either in a stone bowl or on the bottom two pieces of malachite ore and a piece of gold ore, as well as a skeleton reaching toward a gold diamond ring. There is a corridor to the west. The corridor descends a flight of stairs, as you descend you will hear Morokei again. In front of you are two sets of shackles, one of which has the remains of a skeleton with a random dagger among the bones. To the south end is an adept-locked gate, while the north turns to the west and descends to a pair of iron doors. Through the locked gate is a small catacomb with four alcoves behind a lit brazier. There is a leveled shield in one of the alcoves and a random potion in another. There is also a random potion on the ground near an enchanted ancient Nord weapon and the Ancient Helmet of the Unburned. Through the iron doors, you are at the top of stairs leading down to a throne with its back to you. On your left are a burial urn and urn. The word wall that teaches you a word from the Slow Time dragon shout is in front of the throne and a leveled draugr is sat in it. There is also a spectral warhound roaming the area and several nightshades and blisterwort fungi growing around the room. At the bottom of the stairs, on the right is a rock pillar with a tree beside it, behind the pillar is an unlocked chest. The path continues down the right-hand side of the word wall into a corridor flanked by a row of pillars each side; before you enter the corridor, there is a skeleton in the rocks to your right with a silver sapphire necklace. There is room behind the pillars to walk, which allows you to sneak up on at least one of two spectral draugr. There are also two skeletons in this area. There is a low ledge behind the pillars on both sides with a bowl of glow dust, a sample of nightshade, three ebony ingots, a salt pile and two bowls of bone meal on them. At the end of the room there is a doorway into a circular room with another doorway to the south and altars to the west and north, these hold a random poison and a random filled soul gem. The doorway to the south leads along a corridor to a double iron door at the end. These open into the room with Morokei. He is being protected by an energy field being cast by two enthralled mages that are stood on walkways above. You will need to kill/damage these first in order to be able to harm Morokei. Once he is defeated don't forget to loot his ash pile for both the Staff of Magnus and the mask: Morokei. There are several hanging mosses growing in this room. At the far end there is a waterfall, falling into a pool. In the pool is a slaughterfish and at the bottom is an unlocked chest, five loose slaughterfish eggs and two clusters of eggs at the edge of the pool. There are stairs to climb in order to reach the exit, climb to the top and the descend the stairs into the area behind the wall with a deathbell plant, hanging moss and a couple of unlocked chests. The exit is at the rear of the room through another double iron door. This leads to a stairway with a barred wooden door at the top. Through this is a tunnel with a white cap mushroom and large urn on the left and stairs up to a lowered gate with the lever on the right-hand side. As soon as you lift the gate, the door opposite opens and a Thalmor agent named Estormo enters, but just stands there waiting for you to approach. This gives you plenty of time to prepare for battle or just to start firing ranged weapons or spells at him. If you approach he will ask you to hand over the staff and admit that Ancano wants you dead. Once you have dealt with him there is an unlocked chest behind the table on the left along with a couple of barrels, one of which contains ingredients. On the other table there is a silver sapphire necklace on a plate. Through the door that Estormo came through is a catacomb area with a burial urn on your left. On your right are stairs up to a circular room with the remains of a skeleton, a knapsack by the wall on the right and a ladder exit from Labyrinthian opposite. The exit comes out near the second of the two large arches on the approach from Whiterun Hold. Labyrinthian is also visited in Arena, noted for being a particularly large and confusing dungeon to navigate. To mark Labyrinthian as cleared on the map, you may need to clear and exit Lost Valkygg. You may not be able to interact with one of the gold ore veins. This page was last modified on 3 March 2018, at 14:09.